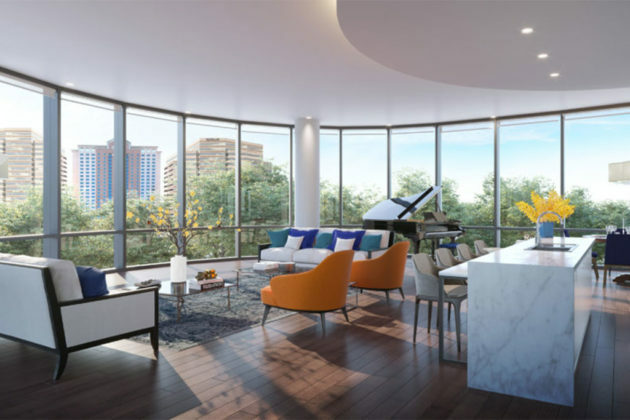 Three years after construction started, the 32-story luxury-apartment tower Lumen in the heart of Tysons is now leasing and soon to open. The building is still undergoing the final phases of construction, with hard hat touring of the location starting later in April. The first move-ins are planned to start this summer. 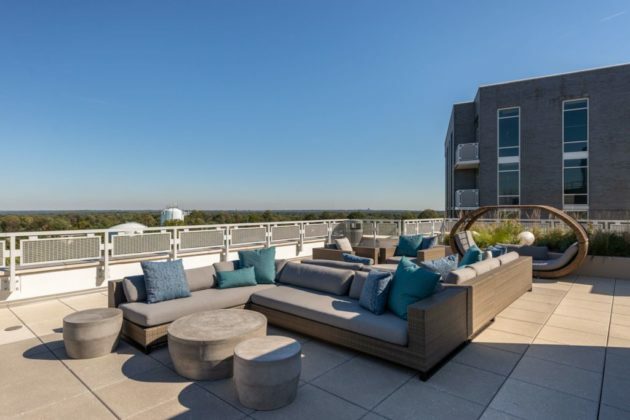 Lumen Apartments is located northeast of the Leesburg Pike-Chain Bridge Road junction, and since it topped-out last July it has dominated the Chain Bridge Road skyline. 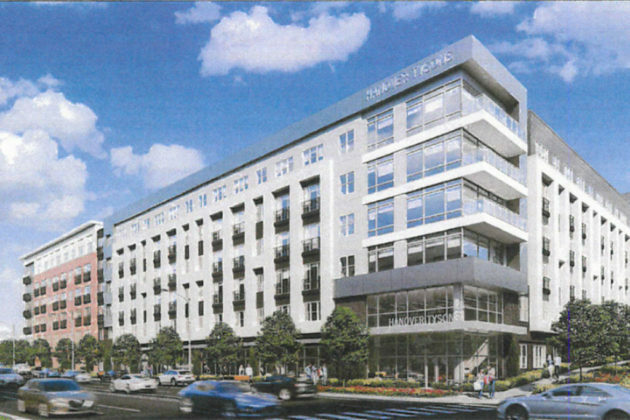 The Lumen is part of a series of new mixed-use projects planned near the Greensboro Metro station, which notably include The Boro project just to the north. The Lumen project contains 398 units on 25 floors, from studios to two-bedroom apartments. The 15th floor of the building has a fitness center and yoga area. 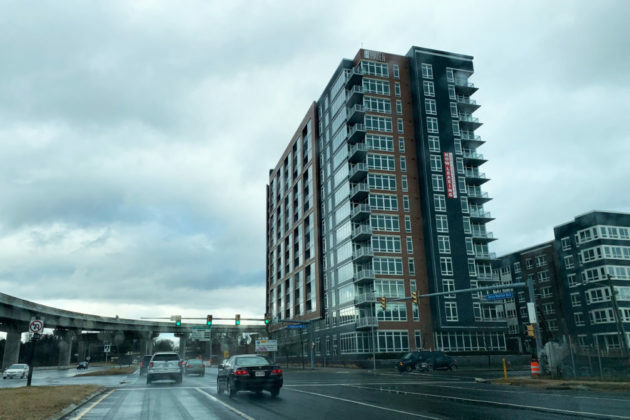 Rental rates at the Lumen are not currently available, but a representative of the apartment complex told Tysons Reporter the information would be forthcoming over the next 30 days. 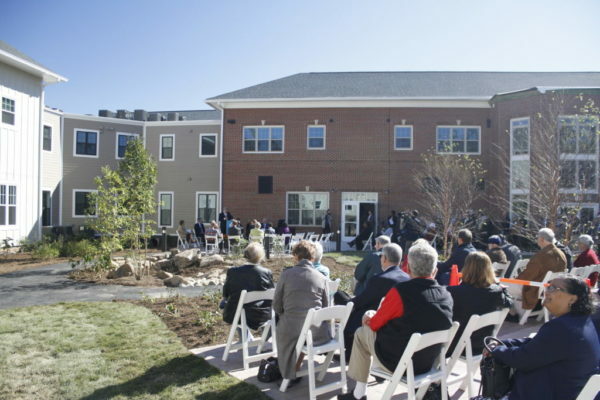 (Updated April 8) As Sunrise Senior Living haggles through the approval process in Vienna, the assisted living franchise also filed permits earlier this week for a new facility in downtown McLean. On March 11, Sunrise Development filed a special exception application to allow a senior living facility at 1515 Chain Bridge Road, replacing the existing McLean Medical Building. In the application, the business noted that the need for assisted living facilities is high in Vienna. Despite immense need, the McLean CBC does not currently contain any assisted living facilities. Per Fairfax County’s compiled demographics for the McLean Census Designated Plant , 92% of households in McLean have one or more people over the age of 60, which is more than double the 43% of households for the rest of the County. Sunrise isn’t wrong on that count. McLean is disproportionately elderly and has struggled to create housing that allows local residents to age in place. Sunrise Senior Living isn’t cheap, so it probably doesn’t hurt that McLean is also one of the wealthiest places in the United States. The proposal for a Sunrise facility in McLean also comes at that area is in the middle of a planning process to reshape the center of town. 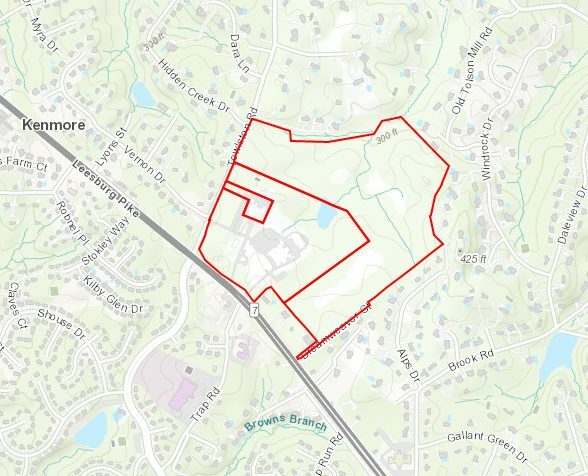 The application notes that the new facility would be located within Subarea Two of the McLean Commercial Business Center, an area outside of the main downtown and planned to have very little change. The Sunrise facility would be replacing an existing medical office building, which it argues is in keeping with the intent of the plan. While the Vienna location is locked in a struggle with the Vienna Town Council over whether or not the building fits within local height parameters, the McLean facility is half the size allowed by-right on the property and 10 feet shorter than the existing building. The project is tentatively scheduled for a Planning Commission hearing on Sept. 11 and a Board of Supervisors hearing on Sept. 24. The Fairfax County Planning Commission moved forward a plan for a new mixed-use residential and commercial development called Hanover Tysons in northern Tysons at its meeting last night (March 14). The Hanover Company’s plan is to demolish the vacant seven-story office building that was built in 1983 and replace it with a new residential development. 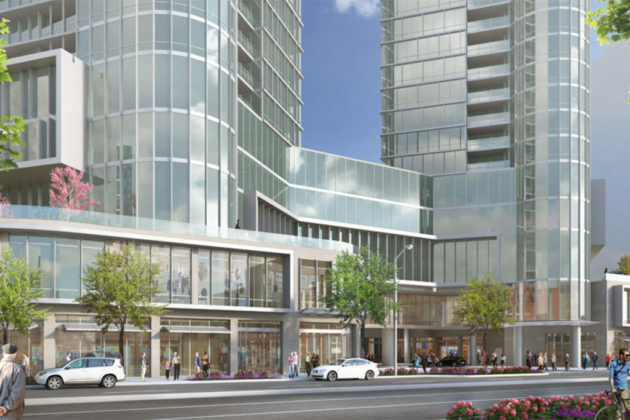 The new residential building would be between five to seven stories with up to 420 dwelling units and include ground-level retail and nearby park space. 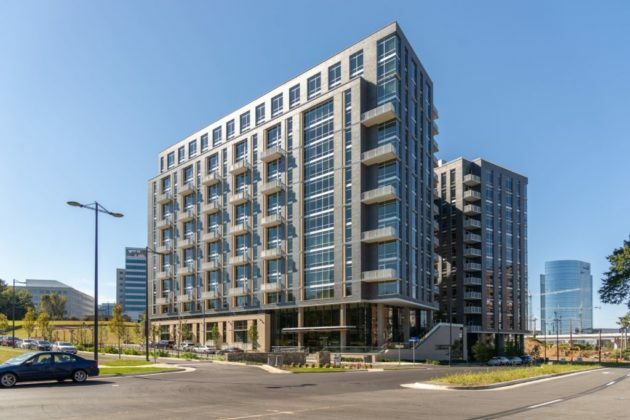 In keeping with Fairfax County’s efforts to promote more affordable housing around Tysons, workforce housing will make up 20 percent of the total units, according to the staff report. 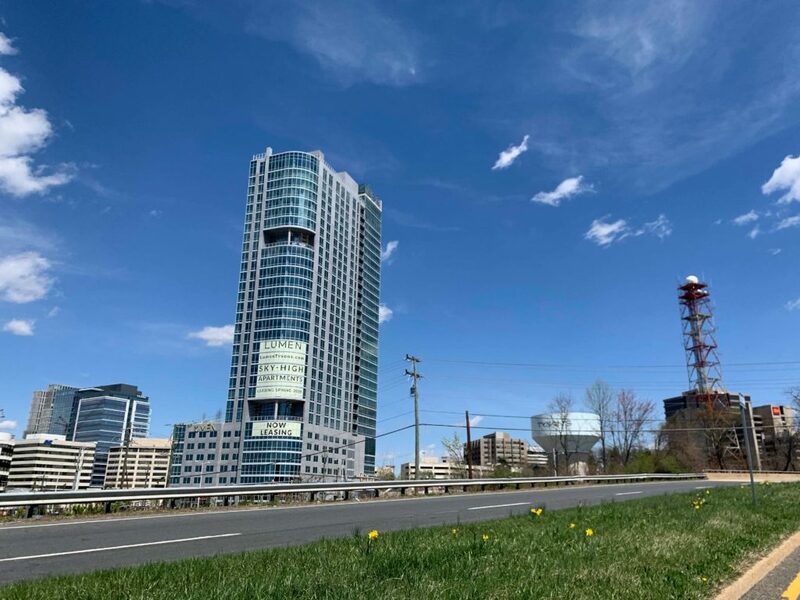 Located just west of Jones Branch Park at 1500 Westbranch Drive, Hanover Tysons is a little under one mile from the Tysons Corner Station. The county’s Board of Supervisors is set to take up the proposal with a public hearing next Tuesday (March 19). The Weekly Planner is a roundup of interesting events coming up over the next week in the Tysons area. Workshop: Fair Housing Protections for People with Disabilities — 12-1 p.m. at The Arc of Northern Virginia (2755 Hartland Rd.) — Non-profit organizations Arc of Northern Virginia and Housing Opportunities Made Equal are hosting a workshop on fair housing protections for people with disabilities focusing on what state policies are for housing discrimination and what people with disabilities should look out for when moving into a home. McLean Public Safety Program — 7:30 p.m. at the McLean Governmental Center Community Room (1437 Balls Hill Road) — The McLean Citizens Association invites the public to its Public Safety Program featuring Richard Schott, Fairfax County’s police auditor and Anna Northcutt, a member of the Fairfax County Police Civilian Review Panel. Community Forum on Housing for All — 7-8:30 p.m. at First Baptist Church of Vienna (450 Orchard St NW) — The Fairfax County NAACP will be hosting an event discussing issues related to affordable housing in Fairfax. Farewell Bell’s at Tysons Biergarten — 11-2 a.m. at the Tysons Biergarten (8346 Leesburg Pike) — The Biergarten is celebrating Bell’s before the company’s beer is no longer sold in Virginia. Everything from fruity drinks to a selection of stouts will be on offer. Registration for the event is free. The event is free and open to the public. A similar event will be held in the Lost Dog Cafe in Merrifield on Wednesday. Chubbies Tysons Grand Opening — 5-8 p.m. at Tysons Corner Center (1961 Chain Bridge Rd.) — To coincide with the coming of spring, shorts chain Chubbies is celebrating with music and free gifts for the first 100 purchasers of items over $99. Backbeat Underground Live — 8-10 p.m. at 1st Stage Theatre (1524 Spring Hill Rd.) — The Backbeat Underground and Virginia Chamber Orchestra will be performing a “souljazz” concert in the Tysons black-box theater. Tickets are $25 at the door, $20 for seniors or advance purchasers, or $15 for students or military. The 8th Annual Nowruz Festival — 10 a.m.-6 p.m. at Tysons Corner Center (8100 Tysons Corner Ctr) — A bazaar with music, dance and costumed characters will be held at the mall to celebrate the Persian New Year. 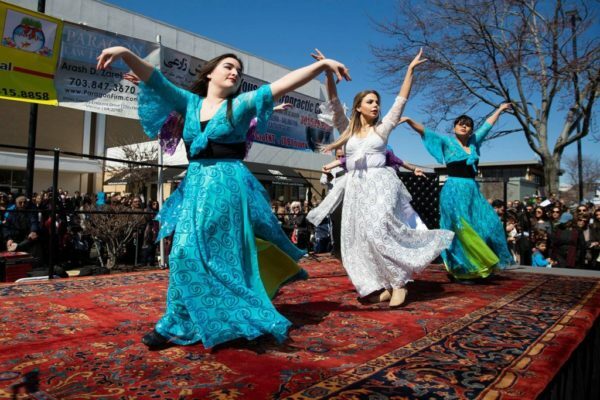 The event is planned to include six hours of live performances and an array of traditional Persian sweets, pastries and other dishes. Trade-In and Trade-Up Bicycle Blue Book Event — 11 a.m.-5 p.m. at Spokes Etc. (224 Maple Ave E) — The Spokes Etc. Vienna location is offering credit for anyone who trades in an old bicycle and an additional 10 percent through March 31 for anyone upgrading to a Trek Disc Brake Road Bike. The Blue Book value guide can help assess the value of the bike for trade-in credit. Capitol Steps in Vienna — 4-6 p.m. at James Madison High School (2500 James Madison Dr.) — Bipartisan political satire crew Capitol Steps will perform at James Madison High School in a fundraiser for the school’s booster organization. Tickets range from $25 to $30. 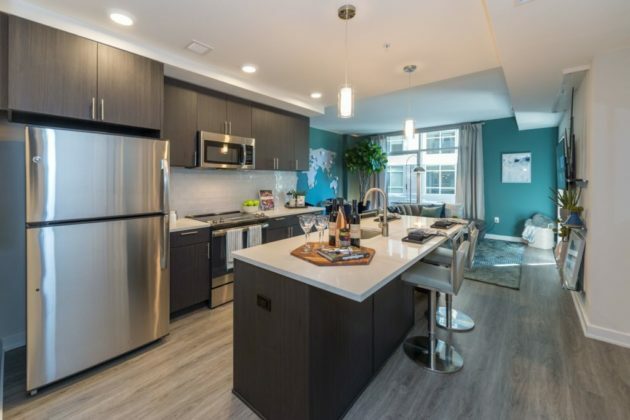 The cost of living in Tysons is high — most of the new residential developments around Tysons advertise their new living units as “luxury” — and there’s a good reason why. And as developers fight over the last few pieces of prime real estate near Metro stations, some are admitting that the cost of setting up shop in Tysons is unlikely to go down anytime soon. 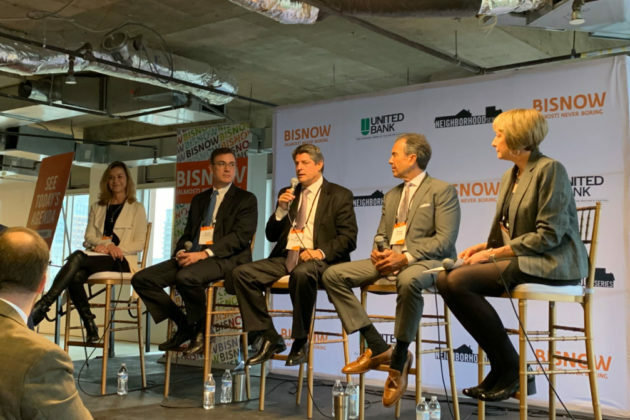 At Bisnow’s Tysons State of the Market event yesterday (Thursday) at 1600 Tysons Boulevard, developers met to discuss the challenges and opportunities facing the region over the next few years. One of the biggest drivers of cost in Tysons is also one of the biggest draws: nearly unlimited density. Speakers at the State of the Market event said a high capacity for density means developers are looking to get more out of each plot of land, which means building up, and that means using more expensive steel frames rather than wooden frames. But the market for residential development in Tysons is focused on areas near Metro, areas where density is king. Developers said a boosted demand for higher-end residential development will likely be one of the main impacts of the new Amazon headquarters in Arlington. Carrol added that from a cost perspective, developers have seen an escalation of almost 7 percent in this market. If there are residential developments that are more affordable than the new luxury developments, they will have to be in places further away from Metro access. “Those further away from the Metro are going to have to make certain changes and accept the fact that their rent streams are going to be significantly lower,” said Brian Tucker, managing director for JLL. 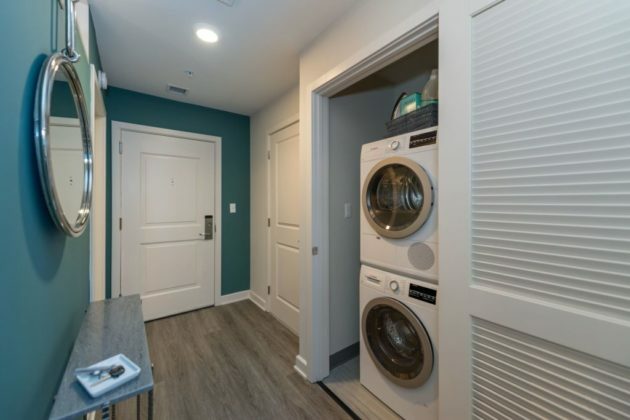 As for who is moving into these high-end residential developments, Bob Kettler, founder and CEO of Kettler, said half of the people moving into condominiums in the area are “empty nesters” — older couples whose children have left their home. The other half is split between professional couples and affluent single professionals. Kettler also noted that the demand is still very present for high-end residential, with prices on units moving up three times over the last four months. Space in the Kingston, one of the newest residential buildings in the growing Tysons East, is disappearing quickly. Tysons has a residence deficiency, with roughly 100,000 jobs but only 19,000 residents. But the demand is there, with the 319-unit Kingston filling up faster than predicted in the project’s initial lease-up timeline. Currently, 44 percent of the building is leased. 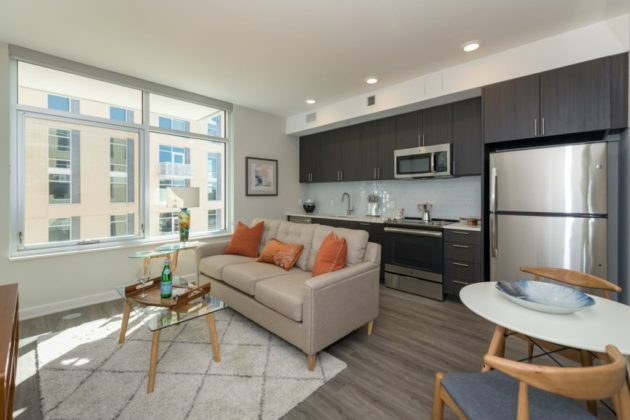 A residential unit in Tysons isn’t cheap either. There are 64 workforce dwelling units on the site, housing required by the county to be set aside as affordable, but the market rate rents start at $2,000 per month for a studio apartment. 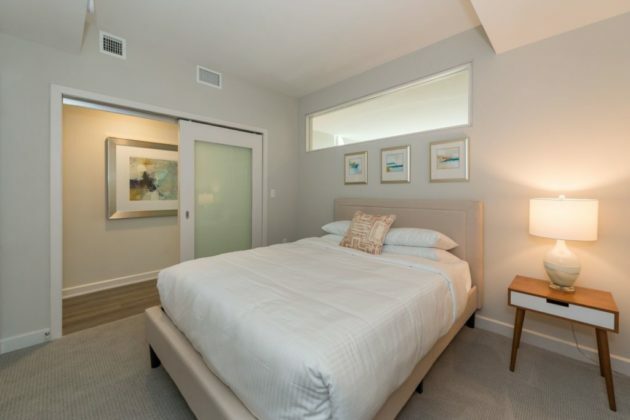 Two bedroom units cost $3,200 per month and three bedroom units lease for approximately $5,200 per month. A press release for the apartment community highlighted the “high-end events” regularly hosted by the property management. It’s been nine years since Hazleton Laboratories, later Covance, closed the doors of its facility near Wolf Trap, infamous for its testing on monkeys and beagles — but life could soon be returning to the site. Toll Brothers, a real estate developer, has plans to build 102 single-family homes northeast of the intersection of Route 7 and Towlston Road. The new project, called Grantstone, is a by-right development that has generated concern among neighbors who say the new development could overburden the nearby roads. One of the biggest items of concern has been the new development’s impacts on Towlston Road, a two-lane street to the west of the property. The Great Falls Citizens Association passed a resolution last summer calling on the Virginia and Fairfax County departments of transportation to reexamine the issue of how much traffic will be generated on the surrounding streets. Foust said the new housing development aligns fortuitously with a plan to widen Route 7 from four lanes to six lanes, as well as make new intersection improvements. 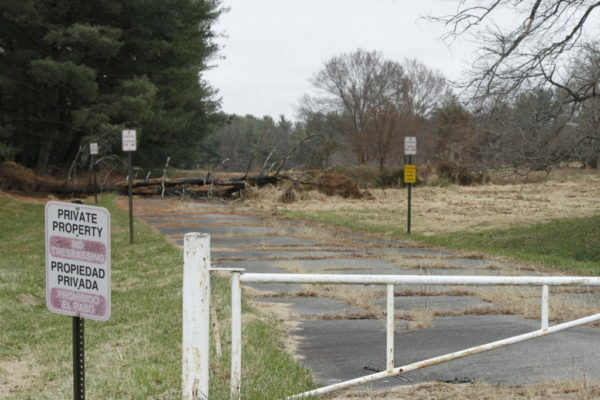 While construction of 102 new homes was planned to start in early 2019, as of yesterday (Wednesday) most of the 113,000 square-foot property visible from outside the “do-not-enter” signs remains overgrown, with cracked roads the only sign of the former facilities. Foust said the development is currently in the site plan review process, and county records show the review was approved on Dec. 21. Foust said the Grantstone development is being done across two phases, and the first home sales are unlikely to start for another two or three years. The Route 7 widening project hit a snag last summer when the costs came in at $95 million more than was originally estimated. In June, the Board of Supervisors voted to approve $40 million to help close the project’s funding gap. An outdated office building in northern Tysons could be replaced by a new mixed-use residential and commercial development called Hanover Tysons if its rezoning is approved early next year. 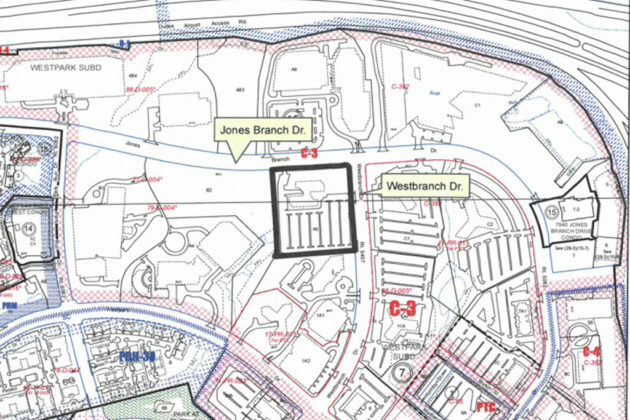 The new development would be located just west of Jones Branch Park at 1500 Westbranch Drive. Currently, the site is occupied by a seven-story office building that was built in 1983 and is currently vacant. 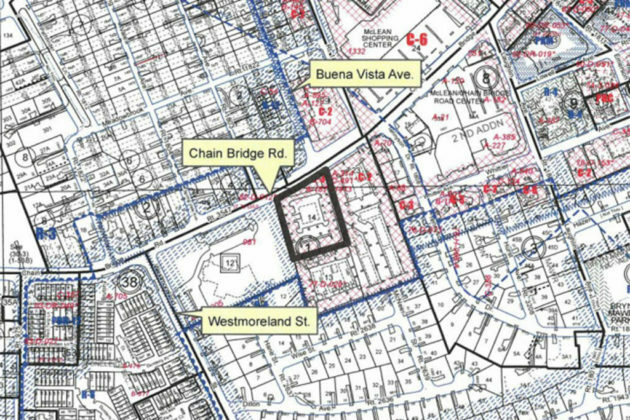 Redevelopment of the parcel would also require rezoning, and is scheduled for a Planning Commission hearing in February 2019, with a Board of Supervisors hearing in March. The new residential building would be between 5-7 stories with 350-400 dwelling units. Portions of the ground level along Jones Branch Drive would be designed to accommodate retail and service uses. 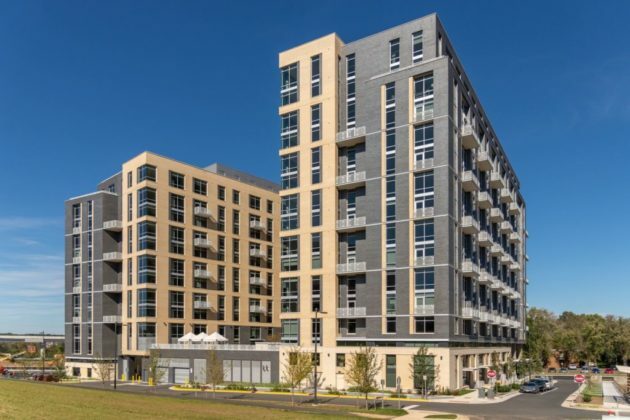 In keeping with Fairfax County’s efforts to promote more affordable housing around Tysons, 20 percent of the residential units, or 66 of the potential 400 units, would be workforce housing. The development would also bring street improvements to Jones Branch Drive and Westbranch Drive, widening them to allow parallel parking spaces, bike lanes, and streetscape improvements. In addition to streetscape improvements, the application also includes new public and private parks for recreational use. 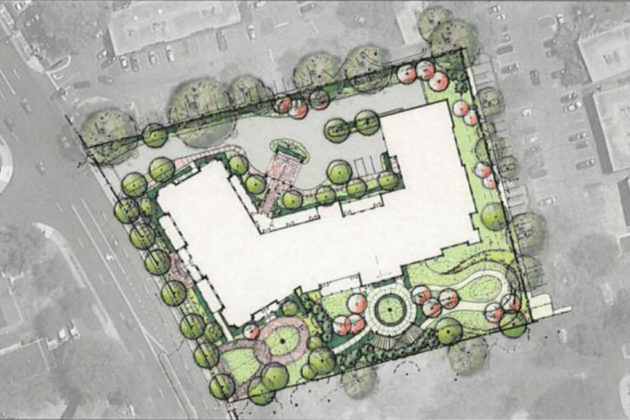 The public park would add 1.12 acres of gardens, trees, walking paths and outdoor seating. The private amenity space would include a new swimming pool.